Can you see the forest or the trees?? The Baby Wagon’s Maiden Voyage! Scarlet Lawrence on THE birth plan…. Katelpetty on THE birth plan…. quasiauthor on THE birth plan…. I struggled for a while not knowing what our birth plan for Jett would be, but I can not tell you how utterly relieved I am to finally have it figured out! I am not kidding when I tell you that I have put together an A team, and that this is the plan that my family needs. I cannot stress the word NEED enough. The only thing I would change is to actually be able to have him at home; however by making one sacrifice, we are at least closer to Dr. Bootstaylor, which makes a big difference–but I’ll get to that later. Some people make may think I am absolutely off my rocker, because society has taught them to fear birth outside of the hospital. Yet if you have been through what I have been through and had to bury your baby–much less been a fly on the wall–you would never question any of this adventurous plan of ours. We know there has to be a much better way than either of our daughters’ births, and we are dead set on making that happen this time around. First, Dr. Bootstaylor (a highly respected Perinatologist whose motto is “bring birth back”) is our “back up” doctor and we have officially hired one of the Georgia home birth midwives whom he backs up to attend Jett’s birth. She comes highly recommended, and we adore her, and there is trust as well which is what matters most. And then in my humble opinion, the most important part is my amazing doula whose sole purpose is to be there for me emotionally. She has been there for me through almost all of my journey and no one will know as much as she does about all of it. She has even supported me through my craziest ideas and inadvertently helped ground me when I needed it the most. Home away from home!! As many of you may have guessed already…. 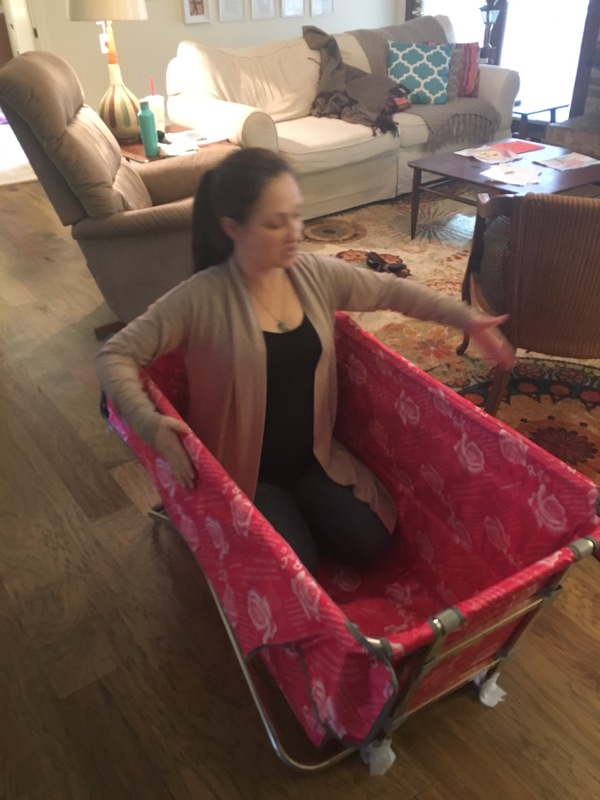 I can not deliver my baby at my home in Alabama with a Georgia midwife as you know by now, right? You are right, that is illegal! Jett will officially be a border baby thanks to Alabama state laws. I am not the only mom having a “border baby” as I know so many moms who are also having “border babies” too or using “illegal midwives”…mum is the word! Society will tell you that you need to be in a hospital. However, if you do the research by getting out there and talking to home birth moms and midwives, you will find that the statistics show that it is just as safe, if not safer. After having two perfect babies born and immediately taken away for reasons connected to the side effects of using labor drugs, I feel 110% that they are right. Seeing what I have been through, I know there has to be a better way. If I continue to be low risk and not have any issues, it seems completely logical to me that I should just let birth happen the way it was designed while I’m in a comfortable place with experienced women who know what to look for, what to do, or if you need to transfer to a hospital. Yes, simply let birth happen the way God designed it to happen which makes perfect sense to me. It seems to me that man was trying to improve on something that was already well-designed; slowly over time, we are learning more and more that we did things a certain way for thousands of years for a reason. Little by little, the side effects are getting more attention and one day society will see it….at least I hope! I am glad ACOG, “the horse’s mouth” has finally admitted that we should delay cord clamping! Little by little it’s coming, but they are stubborn…I am just way ahead of them already. Now, I know there are great supportive hospitals out there, but they are few and far between around here. There are some great, supportive OBs out there too; yet most only practice one way to “birth your baby” and that is medical birth. This practice of medical birth results in many side effects and risks. You hear of all these full term babies being born with “breathing problems” and meconium in their lungs, but these things do not happen when babies are born without all the IVs and labor drugs. I cannot risk walking back into a hospital where I do not feel understood, much less supported, about what I want and ask. Instead, we have a plan. This sums up the plan for now….again Dr. Bootstaylor is our “Back-up” doctor to our Georgia midwife. We will scope out all the RV parks along I-85 over the Georgia line and before Dekalb Medical and pick the best one for us to park our “Home Away from Home”. When I go into labor, the doula and midwife will come to our camper. My wish is to give birth to Jett peacefully and respectfully with a team of sympathetic women who will actually listen to what I am telling them. If perhaps something does not look good, we will be closer to Dr. Bootstaylor and can get to him quickly and he will welcome us with the respect and care we deserve – that everyone deserves, really. Caleb is also planning to build me a birthing stool similar to this one, and I cannot wait to use it. I know in my heart that we have finally come to the best plan for our family to have a SAFE and HEALING birth that we all NEED in reality! We just know that there is a better way than what we have experienced before. We were also able to find a birthing pool that will fit in our travel trailer–hopefully it will go perfect next to the dinette/extra bed! As parents, we can not wait to welcome baby Jett into our family! NOTE TO JETT: You have no idea how much you are already loved, baby boy, and what you mean to us! Your oldest sister has already nicknamed you “Omelette” for some odd reason and constantly wants to snuggle you already–she loves you so much! I have a feeling that you already have a special and close relationship with Eliza and that she is watching over you carefully! Ahhh, can May just get here already?!?! But at the same time, I enjoy it every single time you kick me or poke my belly button. I truly can not wait to have you earth side! Only 18 weeks to go, give or take…. WOW!!! This week has been exciting! Monday, I drove to Atlanta for my weekly prenatal visit, where it has always been great to see them–although I am HATING the drive now. Maybe this one will be last seeing as my “home visit” takes place next week and just maybe Baby Jett could come before I have to drive back again? Tuesday in Montgomery I witnessed, with gladness, a midwifery decriminalization bill passing through the House for the first time in history. I then rushed home to have a meeting with my doula to make plans for Jett’s birth. Wednesday, I saw my chiropractor again, which is always a good thing. Seeing that today is Thursday and needless to say though, I am worn out right now and want to nap; but there is more to do, and this week is not over yet. 38 weeks now and I have a camper, not a hospital bag, to pack. HA! I call this a landslide! YEAs was icing on the cake. I was most proud that Representatives Warren Pebblin, Joe Lovvorn, and Isaac Whorton were among the YEAs. After all, it was time that Alabama gained some common sense and decriminalized CPMs. Sadly, we are one of 6 states that criminalize them, 44 states allow them to work. That fact alone just says it all when you compare us to the rest of the country, or even the rest of the world for that matter. Friends from Alabama Birth Coalition! because that is where this bill should belong. This bill will make our state similar to Georgia, where CPMs can not be charged with a crime for assisting mothers in this state. Even though I will be 39 weeks pregnant, I plan on going back next week to talk with senators to garner more support. Hopefully, we will not have to end up demonstrating how midwives work while I am down there. Although, such demonstration may be what they need. At least I know a couple good midwives that will probably be around! Additionally, we may also line up a Rules committee member to be ready to put the bill on the Senate floor once it passes through the Judiciary committee, because it just has to, right? It is getting more exciting to see this happening right now! I know it more than likely will not take into law before baby Jett gets here, but perhaps by the time we have another baby after Jett! Apart from these politics, the best part of the week was sitting in my camper with my doula and talking about our birth plans–it is getting so close! I think my doula definitely has her work cut out for her when it comes to me. Doulas give emotional support, and she has been with me since I lost Eliza. Therefore, this has been an extremely long road, with ups and downs the whole way; but we are closer to the good parts now. At this point, she has become more of a best friend. With her guidance and presence, I am excited for the most part about this birth. I cannot wait to experience it with people who make me feel I am being listened and take cues from me instead of the care I have experienced before. While I am not scared, there are things I acknowledge with anxiety that simply cannot be controlled. However, such concerns are normal for any parent who has lost a child. These concerns are a fear that will always take your breath away, no matter how much you have planned and prepared and changed things. I know that I am different from most parents because of the fact that my daughter should not have died that day. And to prevent a repeat for the upcoming birth of her brother Jett, I have done everything in my power to change the things in the situation that caused her death. I have put together a team of people I trust, and I know that this birth will be much different than what I have been put through before. preferences and even set up the birth pool that we may use. Earlier, we had worried about what would fit in the camper, and the one she brought in fits perfectly. We established this plan for retrieving and maintaining the water within the birth pool warm. We needed to think creatively, because campers typically contain hot water heater that only holds about 6 gallons. Only six gallons of water. We planned to have lots of big pots and utilize the stove, outdoor grill, fire pit, and a burner, if need be, to get the tub filled. My doula helped me think of things I had not even remembered, which I have found beyond helpful such as groceries! There are some things though that you cannot plan, which is to plan exactly where or when I will give birth and how that will turn out. I plan to simply listen to my body and do what it tells me to do this time. For this, I am beyond being excited. I dream about it often, although I admit that I probably cannot even comprehend what this birth will be like. Yet I know that I cannot wait to experience giving birth the natural way. I know that I am strong and I trust my body more than ever. I will be listening to my body first and foremost this time. Anyone care to guess when Baby Jett will make his appearance? My guess dates are 5/8(by LMP) and 5/11(by ovulation). The full moon will be May 10th, and I am gonna go with that day for now. We have to wait and see if that full moon stuff has any weight. Both my girls were pretty much right on time, which also makes May 10th feel solid to me too. It is quite clear that there is a birth monopoly in Alabama! I think a lot of people do not actually understand what all a midwife does or is capable of for that matter, especially CPMs. I really want to explain how things differ from the medical model of care thus far in my journey. With both my girls, a prenatal appointment with an OB would go something like this: I would arrive and sign in and let them know that none of my information and insurance had changed since the last appointment and then I would sit and wait to be called back. A nurse would take my vitals and then ask a few routine questions. I generally thought the doctor would see these answers and go over what was important, but that never really seemed to happen. I would pee in a cup and they would stick a dip stick in and read the results, but never mentioned the reading to me or what it meant for that matter. They would measure my belly, listen to the heartbeat, and do the few tests that you get along the way, but still they never explained results or anything. I would see the doctor for maybe 5 minutes tops and this meant you had to be fast asking questions which I usually forgot in the moment. I would always forget to write them down. The doctors were always in a hurry given their high patient loads. With AdaRee I was anemic and my iron levels got really low which got even worse while taking iron pills which was their only known way of fixing anemia. The pills made me even more sick so they just told me that I needed to stop taking the iron pills. I was told that I would just have to be admitted to the hospital once it got extremely bad. I was horrified at the thought and googled how to fix my iron issue. I started eating lots of spinach, red meat, broccoli, and started cooking in cast iron more which was my first experience in the power of diet changes. My iron issues were never even really bought up again except to say that I wasn’t as exhausted anymore nor was I tested again until after she was born. My diet changes alone had brought my iron back up to above normal and I will never forget the look on my doctors face when he saw that. He could have very well told me to change my diet had he known anything about that aspect of life in general, but doctors have minimal requirements when it comes to studying diet and how foods can be medicinal. It is clear to me that OBs are generally trained to fix issues, not prevent them. This is why midwives can prevent issues because they learn these tricks instead of learning how to medically treat the issue after it is a problem. OBs are in and out and on to the next patient and are not focused on prevention, just fixing the problems after they have become a problem. I call this the starter kit – a pregnancy book, pregnancy tea, and my personal notebook filled with great info and a place where I can keep all of my questions and plans! My birth kit containing the basic supplies for Jett’s birth. which is crucial for me because I need to know the person who is going to be there when I go into labor and not feel like I am playing Russian roulette with whomever happens to be on call that day. Both my babies were delivered by doctors I had never met before and that is completely unacceptable to me on every single level. This is far too great of an event for it to be left up to some random person that happens to be on the schedule. I was also given a notebook with all kinds of information on all the hot topics within it and it is just a nice place for me to keep my plans and additional information I find. I also keep my questions in there too which I have found to be super helpful, because I am talking about everything this time. My midwives are also okay with whatever I choose to do and support me even if it might not be something they would choose and that is invaluable in my opinion. They go over the results of each test and explain what it means without me even asking a question. It is apparent that they are very used to moms taking an active role in their pregnancies and births. I have said it before and I will say it again and again…having a CPM is like having a gourmet chef versus my Ob experience being more like the likes of going through a McDonald’s drive thru. And by the way, I refuse to eat at McDonald’s ever again, so that should tell you something! There are some amazing ones out there like my personal hero, Dr. Bootstaylor, but they are few and far between. That being said, there really is not a price too steep that I would not pay to have CPM care at this point. It is worth every single penny! About one month till we get to meet our rainbow! Our society changed how birth was done in major ways years ago by moving it from the home to the hospital and replacing midwives with OBs. This was not for the health of mama and baby though sadly. Most of us low risk moms need a midwife, not the training of an OB which is great for true high risk, but it is just not that common. When you start with the medical model though, you have to end with the medical model which often times ends in sticky situations and side effects. I want to define the medical model really quickly and that does not just apply to labor drugs and epidurals. It starts with the hospital itself. It is all the monitors and especially being made to lie on your back in a hospital bed. It is most definitely being hooked up to an IV which makes it easy for them to give you medicines and drugs without your knowledge. I can not tell you how many moms got their medical records only to find out that they were given something that they were not even aware of such as pitocin or antibiotics. The medical model of care starts as soon as you walk into that hospital and it is perfectly fine if that is what makes you comfortable, but be aware that things can end in unnecessary surgery this way if you are not careful. Statistics prove this seeing as over 32% on average of women in hospitals end up in cesarean sections versus homebirth moms being around 5%. It ends with moms who wanted one thing and ended up with another because it is drilled into us to be prepared to change our plans. That is a MONUMENTAL difference and demonstrates that your risk of ending in surgery correlates directly with where you give birth. If I had stayed at home, my daughter would be here with us because the medical model literally squeezed her to death. There was no real NICU available on top of that, so the hospital literally failed my family in every single way possible. I am fully aware that on occasion true medical emergencies happen though and that OBs are best when there is a real issue – one that wasn’t caused by labor drugs or their protocols/techniques to begin with. Again, all the things listed above. The IVs and drugs have very real side effects that are not disclosed to you, but it is written on the package inserts. There are also many studies that show that monitors and being on your back delay labor, which is the biggest reason to start augmenting labor instead of actually finding what position works for each individual mother. It is a cycle that most are overlooking sadly because no one ever explains to them that these drugs and IVs can cause your babies’ heart rate to drop which would then need an emergency surgery. So please, I do not care to hear again that a hospital is where I need to be! I have done my research and made my choice. My midwife though is fully trained and experienced and has also saved babies’ lives as well. She does come prepared with the medical supplies necessary and her experience is priceless. She allows birth to take its course naturally and ensures that it goes well versus intervening in the process like the medical model does. God designed birth and he did it that way for a reason. If for some reason a cord prolapse or uterine rupture happened, it is not gonna matter that much where I am anyway and those are the real dangers. I have been through the worst nightmare anyone could go through and I wish pieces of it had been recorded because it would make you sick to your stomach to have seen what I was put through while in labor. It was agony and the only thing I can do to honor my daughter is to tell our story in hopes that it can help make a difference in this broken system we have. There is lots of information out there that is not being shared with society. You have to look deeper to see it. Profit lines and jobs are not more important than actual health. God designed us organically and we put far too many man made toxins and chemicals in our bodies and that is the problem with our health overall really. God gave us everything we need, but we all know the nature of man. 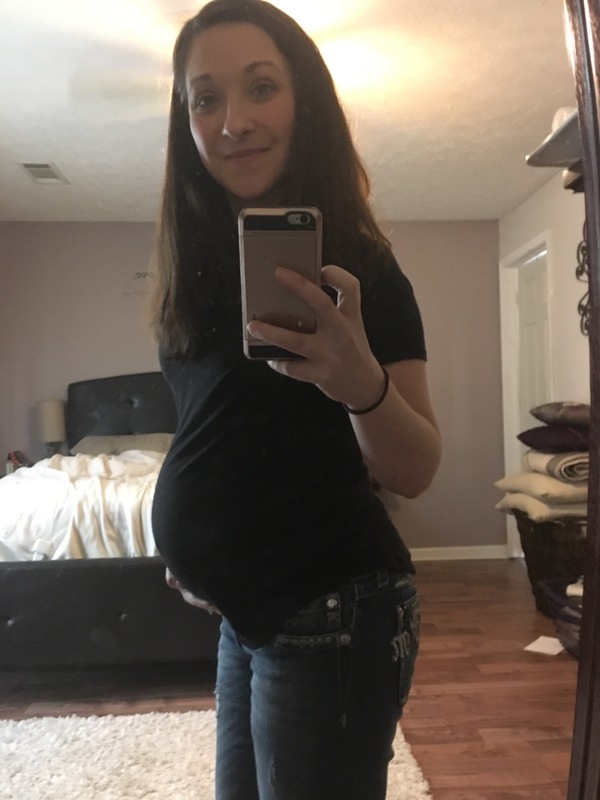 35 weeks with a rainbow!! Nesting has begun! In celebration of our 4th wedding anniversary and because it was just the first time we could make it work, we took out The Baby Wagon so that we could start breaking her in before the big day this past weekend! It just so happened to fall on the 4th anniversary of our honeymoon too which was pretty cool. AdaRee was beyond excited to go camping and despite all of us suffering from allergies we were bound and determined to enjoy our first outing. I really anticipated it to be a big ordeal, but in reality it was much simpler than I was expecting. We hooked it up and hit the road with ease. We traveled the interstate and that we pretty smooth sailing as well. Caleb was pretty awesome at setting up the camper especially given that it was his first time and it was starting to get dark on top of that. I was so proud of him. Luckily we were also able to text the sweet family we bought it from for some quick pointers and that was a real help too. We went to a neat campground nearby called 3 Creeks Campground and it has a roller skating rink, a water slide park, and playground within it, so we did not make any plans for anything except to just experience life in an RV. Our allergies were pretty rough, so we were pretty lazy most of the time, but hey – that’s the best way to break a home away from home in, right? Luckily we had leftovers from our anniversary dinner the night before to eat the first night after all the set up and everything. AdaRee took her first camper bath and she loved it! It was just the right size for her and we sat on the couch and watched TV while also watching her bathe which we thoroughly appreciated for a change. Then we crashed early from all the excitement. AdaRee loved having her own room too – maybe it was because there was a TV in there? Hmmm…that may have to disappear somehow. Caleb’s allergies were the worst on Saturday, but he managed to push through like a trooper. We lazily got up and had a late breakfast. I took my first camper shower and 6 gallons of hot water almost made it for me to get a good shower in although 7 would have been perfect. I am not sure how warm Caleb’s shower was, but he did not complain. We headed out for a Dollar General to pick up a few things that I forgot and to just have these things in the camper so that I do not have to move them back and forth. We explored a few local places to eat and then headed back. I was so excited for AdaRee to go skating for the first time and I wish I was the one who had been able to do it with her, but I figure that being 8 months pregnant was not the most ideal time be on roller skates…but I grew up roller skating so we will definitely be doing this again after Jett gets here. Adult coloring books for natural birth! Could one be anymore excited?? tiny houses, because there are a lot of advantages to living in close quarters. I just highly recommend that your family gets along and really likes being that close together! I can say for certain that I married the right man and that there is no one else on this planet that I would rather go through this crazy thing called life with other than Caleb Petty. We have done so much and been through so much together in the 6 years that we have been together that I could not imagine planning anything without him. We are planning Jett’s birth to be healing for us both, not just me. Caleb also trusted the medical professionals there and he went through it all with me and witnessed what his wife was put through although there was not much he could do to help me, so this birth is going to be all about Team Petty! We think that the close quarters will make it better for us and plus we will have the added benefit of getting creative with the space for keeping me more comfortable. Most animals seek out a small dark place and an RV can easily be that. It all just felt good to us and we are excited to get closer to May! TEAM PETTY for the win!!! As some of you may know, HB316 is being voted on tomorrow so I have been busy writing emails to legislators. I am making this one public because I want everyone to know exactly why MASAs amendment will kill this bill making midwifery care technically allowed, yet impossible. Hopefully, they will hear my plea for this bill! First, you all need to know briefly about my story. Had this bill been in place in 2015, I would have chosen midwifery care and my life would be much different right now. It was not and I walked into my local hospital at 8 cm asking for a natural birth, but no one there knew how to support a natural birth. The medical model of care and the midwifery model of care are two very different approaches as you all know. My perfect daughter lost her life because of the medical interventions that I was pushed into while I was in active labor. No mother should have to argue nor convince her care providers of her choices while in active labor. This bill means so much to my family, not only to honor our daughter, Eliza Petty, but I am now 8 months pregnant with our first boy. Now after the hell that I have been through, I have found the most amazing perinatologist in Atlanta named Dr. Bootstaylor of See Baby(please, look him up so that you can see what kind of top notch OB I’m talking about – www.seebaby.org). He is what maternity care should be like and what should be Alabama’s ultimate goal. He is my back up doctor and fully supports and encourages me with the Georgia CPM that I have hired. I see them both and when I go into labor, I will make my way to Georgia to meet my CPM and Dr. Bootstaylor will be ready IF we were to need him. Now that my friends, is perfect care and would be an amazing future for maternity care if we could get the OBs here to accept CPMs and work with them, not against them as they are now. Not only do many moms in this state need CPMs as a basic option, but it is also one that many other moms would choose such as myself. If a mom who has gone through the worst tragedy any mom could go through is knowingly making the decision to do this, there must be safety and comfort there. I would also like to add that we have had to move mountains to make this happen and I am very thankful that we have accomplished this, but no mom should have to go to these great lengths for this!I also want to address two major issues with MASAs amendment that stand out to me. Everyone needs to be aware that CPMs do not need to study as long as nurses would because they do not use all the drugs and protocols that hospitals do. Let’s be real – it is based on a natural process and experience is where you learn natural birth making it much more simple. Therefore sitting for the CNM examine does not make sense because they will not have knowledge of epidurals, pain medication, hospital protocols etc because they will not be using them at all. Secondly, the list of qualifications to be able to birth at home is, to say the least, impossible. Many different items would disqualify me completely from being eligible for a home birth, yet my perinatologist is fully aware of my entire history and recommends a home birth for me. Did I mention he is one of Atlanta’s top doctors and that he has a 5% cesarean rate – I am sure Medicaid would love to see a rate more like that? These qualifications need to be left to the care providers involved and not in our laws. I also do not think that breech and multiples need to be included, but from what I understand this is one way that ABC has tried to please MASA. This bill needs to be passed, so I am okay with dealing with changing that later once we get CPM access and it proves itself. I am confident it will as long as we do not over regulate it and give it time to work and expand. We are not asking for something that no other state has not done successfully as I am sure that you are already aware that 32 other states license and regulate CPMs. I am also sure that you are aware that the majority of Alabama does not even have access to care which makes the passing of this bill an emergency in reality. Please, vote YES to HB316 with no amendments!! Things have certainly been moving along for us pretty fast wether we like it or not… I can not believe that I am over 27 weeks pregnant right now. The third trimester and home stretch! Do not ask me how many months I am, because I would be hard-pressed to count on the spot. There has been a lot of anxiety, but we are staying positive and putting into place the things we need. Controlling the things we can and trying our best to not worry about the things we can not control, but that is by far easier said than done. We also apparently have a nesting need that requires major home projects. Caleb thinks that our sudden move to remodel the kitchen was also a distraction which I can agree with; although it is making me crazy now having my kitchen in shambles. Three years ago, we did a whole home renovation with AdaRee still in my belly, which we were still working on less than a month before she was born–it was torture, but everyone was right saying we would laugh about it later. With Eliza we built a privacy fence and outside storage shed. Therefore it is fitting that we redo the kitchen for Jett. Caleb is a “granite artist”–it says so on the sign outside of where he works which is very true. We have the hook up on that, blessing us with an extremely budget friendly kitchen remodel. At least I focus my worries over the mess in my kitchen instead of all the things that could happen. I have said this a million times and I will say it again… “I can keep what happened to Eliza from happening again, but after meeting so many moms that had things happen that were out of anyone’s control, those are the things that scare me now.” These are things that happened and could not have been stopped, even though they were in the hospital; that is not a factor for me at all. I am confident in my birth team, and I know that they are well equipped, so that brings me peace. I did not realize that being pregnant again after losing a child would bring so much anxiety. I was warned by other mothers, but I refused to think it would apply to me. However, it does very much. I also did not realize how much it would make me miss Eliza even more. That has been the hardest part throughout this pregnancy. As Baby Jett grows inside of me and AdaRee hugs on my belly, I can not help but wonder what my life should be like with my perfect Eliza here with us. Would she be on her sister’s heels copying everything she does? Would AdaRee be annoyed with that? Or, would they be the best friends that I dreamed they were going to be? Eliza should be here with us and it is not fair at all! And then comes the anger because no one listened to me that day as I kept telling them over and over for hours that it was not right and that my contractions were not stopping…instead, I was just treated as if I were being a drama queen. Perfect babies do not die for no reason at all. Babies should not be born with low oxygen and blood levels and need major resuscitation efforts due to labor drugs. Oh, the anger is really hard, especially with how I felt about the way they treated us after everything we were put through. I saw how their treating us deepened our pain and worsened our grief, which leaves us with the bitter feelings we are currently feeling. Looking back, I felt like they took advantage of the state of shock we were in. I still do not think we have even begun to fully process all of what happened in those days, and it will very likely be a lifelong process. I also had no clue what PTSD really was until now, which is another major reason why we chose midwifery care over the normal medical model. It is to me a comparison between having a gourmet chef instead of say, a McDonald’s drive thru. All the same things are happening throughout this pregnancy with Baby Jett, except I have care providers who make me feel they care about me, what I am going through, and take the time to talk through it all with me. They help me make the decisions instead of making them for me and not informing me. It is crazy how I read online the discussions within my local mommy groups that they are waiting up to 2 hours in the waiting room and then see the local OBs for maybe 2-5 minutes tops. I could NOT handle that after what we have been through period. It makes me thankful for the care that I am presently receiving and that my family has been able to make this “luxury” happen despite the costs involved with it. There is no price I would not pay to make midwifery and doula care happen. The reason that the offices are flooded here in Lee County is largely because Chambers County no longer offers OB services, resulting in more moms driving the distance. This subsequently forces many Lee County moms to travel outside of the county to Montgomery or Georgia for care. This is yet another HUGE reason why we need to pass the Childbirth Freedom Act or CPM bill here in Alabama, allowing moms to have another option in maternity care, most especially the prenatal care alone because they can still choose to deliver in a hospital. Moms in rural areas of Alabama with no access to OB services could use a midwife for prenatal care and also deliver in a hospital if they can make the trip which in turn would save lives and move Alabama’s infant mortality rate down. The list goes on of benefits to this law. 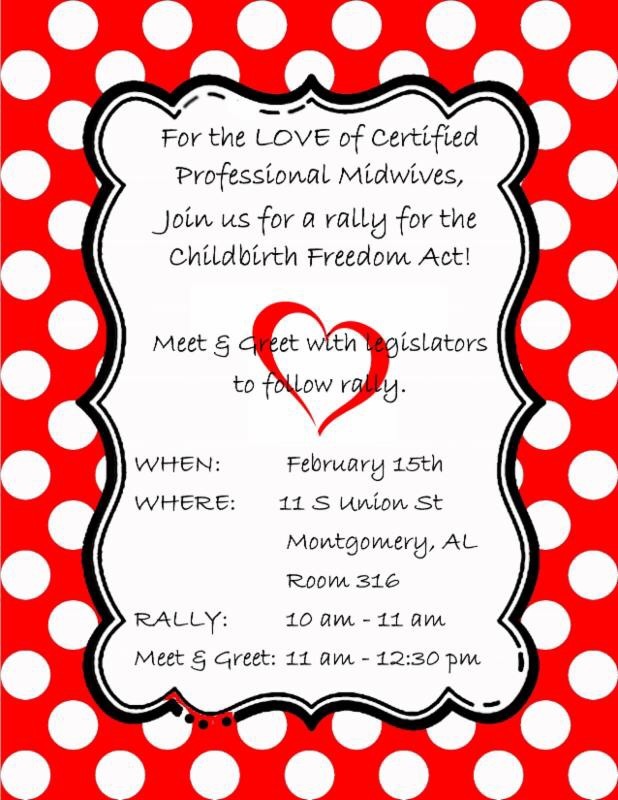 Next Wednesday(February 15, 2017), AdaRee and I will be traveling to Montgomery for Alabama Birth Coalition’s rally for the Childbirth Freedom Act, which will allow CPMs to practice here. While it is obvious why I want this bill passed for me and for AdaRee, this bill is also the best way I can honor my other daughter Eliza and her memory most of all. I would love for any local moms to join me, and there is extra room in our minivan for carpooling. Hopefully, we will talk with Representatives Joe Lovvorn and Isaac Whorton as well as other legislators and lobbyists. We have a hard story to tell, but it needs to be told in hopes that it can bring about changes for all the women in Alabama!